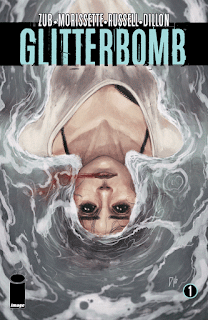 The Fellowship was fortunate enough to obtain a copy of GLITTERBOMB #1 from Image Comics. Jim Zub writes, Djibril Morissette-Phan draws, K. Michael Russell colors, and Marshall Dillon letters. Farrah is a pretty average thirty-ish in Hollywood, just trying to make a living for herself and her little boy. Today’s audition didn’t go so well, so on her way home she stops by the beach. Maybe she’s depressed or maybe the water called to her – either way, she goes in. And something happens. The upside is that now she’s no longer alone. The movie industry is a tough place to work, and Farrah hasn’t been treated well lately. Now she’s going to find out the hard way how good an actor she really is. The industry will probably never be the same, either. This is definitely a first issue that makes a point quickly and with precision. And the art is top notch, showing both the calm before the storm and the storm itself with equal feeling. Farrah’s life just got interesting, in a very weird and horrific way. I’m very curious to see what she can do with it, or about it, or something like that. This is surely going to be a fun ride, so go get on it now. GLITTERBOMB #1 is available now at your FLCS or at imagecomics.com.